With Buy It Locally™, a shopper can reserve or pay for in-stock items for pickup at local stores just like buying online for shipment. Pay Online, Pick Up In Store Accept full payment for in-stock merchandise. Reserve Online, Pay In Store Let your customers reserve items for 24 hours. Local Delivery [coming soon] Be better at the last mile than any online merchant. With Buy It Locally™, a shopper at any point of the Locally platform can reserve or pay for an item for in-store pickup. Brand Sites Make your merchandise actionable to nearby shoppers on brand sites. Locally Pages Accept holds and payments from your own site and social channels. Locally.com Lock in a sale before a locally.com visitor walks through your door. Simple to set up. Simpler to use. 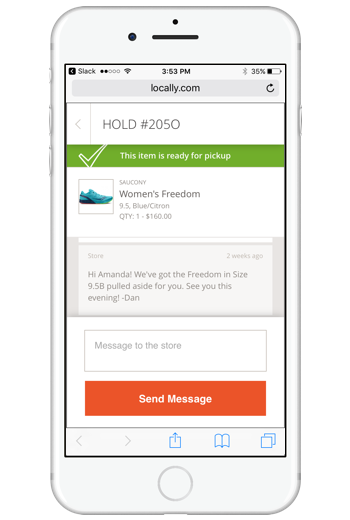 Locally sends order notifications via email and/or text, allowing your store to respond within minutes. Set up as many recipients at your store as you'd like, and even schedule them to receive notifications during certain times. 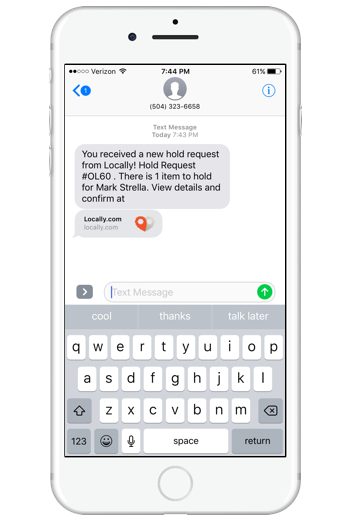 Buy It Locally™ is built around the ability to message back-and-forth with a shopper to confirm reservations, answer questions, or resolve any potential issues with their order that may arise. Locally charges a transaction fee of 3.5% on confirmed pickups, and standard credit card processing charges apply to online payments. Rates are available within the Buy It Locally™ setup area in your locally.com account. Ready to start driving sales? Log in to your locally.com account and complete your Buy It Locally™ setup & configuration, run a test transaction with our retailer support team, and you'll be ready to go live.